Frac Daddy will break from post position number two on Saturday during the 2013 Holy Bull Stakes at Gulfstream Park. 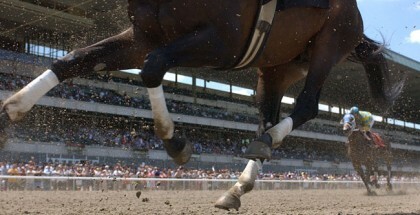 The 2013 Holy Bull takes place this Saturday January 26 at Gulfstream Park. Ten talented three-year-old colts have officially entered the race and drew post positions today. Lady and The Track’s leading favorites Shanghai Bobby will be up against the rail while Dewey Square breaks from post position six. Experts suggest that Shanghai Bobby is the horse to beat this Saturday. They say he is a strong entry but aren’t sure how he’ll compare to the other two-year-olds on the field. 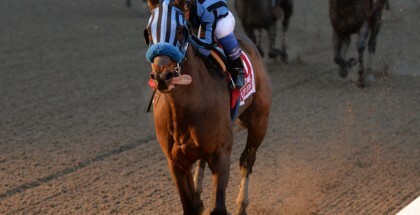 Itsmyluckyday is said to be an extremely fast horse and most experts think he will place second behind Shanghai Bobby. Dewey Square and Frac Daddy are considered to be the wild cards of 2013 Holy Bull. 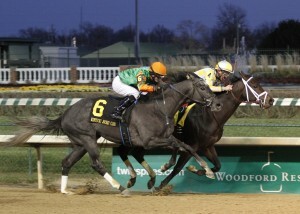 Dewey Square and Frac Daddy both have tremendous potential heading down the Derby Trail. Apparently, if you have lazy half-brothers and sisters like Tulira Castle, the critics predict you’ll be a slow runner too! Clearly Now has never run on dirt before and is trying to transition to the Derby Trail. Clearly Now is a newbie from Canada testing his limits. Nobody really knows what to expect from him. After my predictions last week, I’ll need to check the weather report on Friday to see if the forecast calls for showers. It usually only sprinkles in Florida for 20 minutes tops! The Sunshine Millions were a prime example of how truly unpredictable and heartbreaking horse racing can be, especially when it rains! I‘m somewhat feeling lucky about Frac Daddy for the 2013 Holy Bull Stakes. Frac Daddy seems to be a hard worker. I also like Tulira Castle simply because I’m a Javier Castellano groupie. If you’re a fan of Lady and The Track though, you’ll know I always bet with my heart, and never with my lover’s money (it’s simply bad luck). So, my shoe shopping money will definitely be placed on Dewey Square and Shanghai Bobby. I love them both for two very different reasons. You can read more about my two favorites by checking out the interviews LATT conducted with both Dewey Square’s and Shanghai Bobby’s connections. Lady and The Track would like to wish all of the 2013 Holy Bull contenders the best of Luck! Good Luck! Safe Run! Keep an eye out for Trixie at the track on Saturday! The Holy Bull at Gulfstream Park is the tenth race of the day. Post time for the 2013 Holy Bull Stakes is set for 5:05 PM EST. Dewey Square had a “bullet workout” on Sunday preparing for the 2013 Holy Bull Stakes. Experts categorized Dewey Square as a Holy Bull wild card.